And is it just a question of ratio, or $DWF is really stronger? They share a lot of things in common, but are different, both are cyclic but DWF is aimed to give positive returns on a longterm period. DWF should be smoother than DWC as the history shows. I like the shape of the equity curve. Many ups and downs like every robust system, and a nice 5% on the 3m timeframe. It seems legitim to expect an annual return of 20% with a DD of 10%. One week is not significant. Now if we look to 3m chart the advantage of DWF over DWC is only 4% . 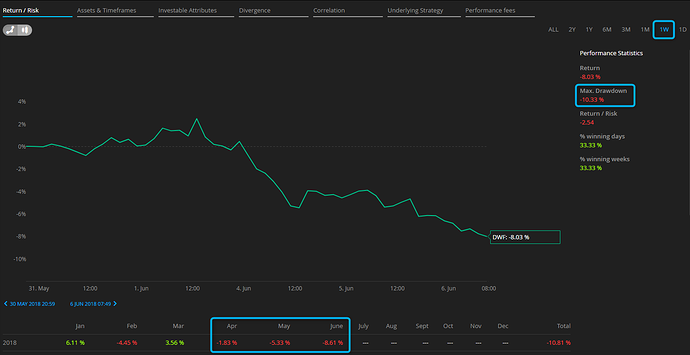 Daily volatility on DWF has been really high recently. Even today after Asian session it's already around -2.5%. 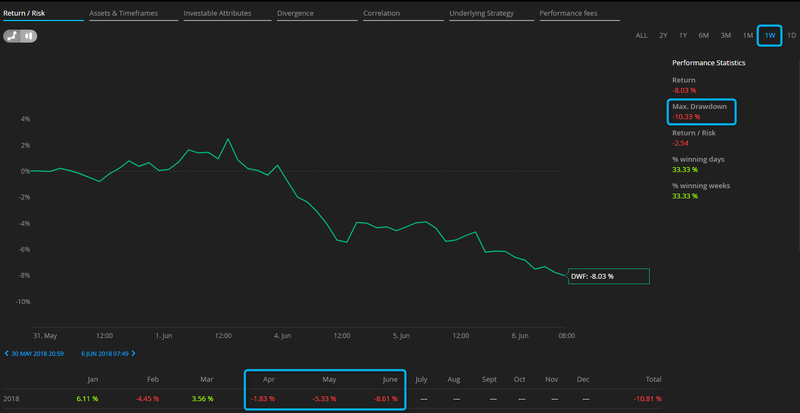 Is it just me or are there also other traders/investors who think that Darwinex product should not have such high daily volatility when it is portfolio and not single Darwin. so also dailty volatility can be 4-6% like every darwin. Problem isn't volatility, the problem is that should grow but it doesn't seem to grow. To me DWF and DWC are portfolios because they invest into Darwins. DWF/DWC are not Ignacio's or Juan's own strategies. They pay performance fees to traders so DWF/DWC are not like mine or your Darwins. They are strategies, not designed by @ignacio or @juancolonbo . But designed/developed by @DarwinexLabs , AKA @integracore2 and @javicolonbo . Fees are turned back to traders with darwinian dividends, but a part from this they are normal darwins. As explained in several webinars and posts, these are NOT Buy & Hold products. Are also high water marks used for these Darwins? If yes, can you publish this list again in 2 weeks? Edit: a high water mark proves a payout seen from the investor‘s view. Sorry, @Journalist not sure what your point is? I don't have access to each high watermark myself, but you are more than welcome to keep track of the performance fees, of course! Risk managers ! Quants ! The current second quarter is a horror (to see a shame). -10% on one week ! Please Stop your DWx, what else ? You concentrate on what you can do. @TheCheetah I would highly recommend watching the "VaR" videos to understand the relationship between DD and VaR (hint: they have nothing in common!). c) opt NOT to invest in a given DARWIN they don't like. That being said, I would appreciate if you could keep your tone respectful when it comes to Darwinex employees, I doubt there is anywhere else where you could have attracted investors with your 7 USD account, so the least you could do is keep your tone respectful.